Dynamite Digger Slot Machine - Casino Answers! 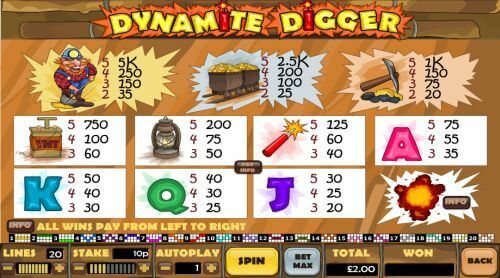 Dynamite Digger is a 5-reel, 20-line video slot developed by WagerWorks, featuring cascading symbols. You can play the Dynamite Digger video slot at Bovada. The Dynamite Digger casino game is a penny slot. 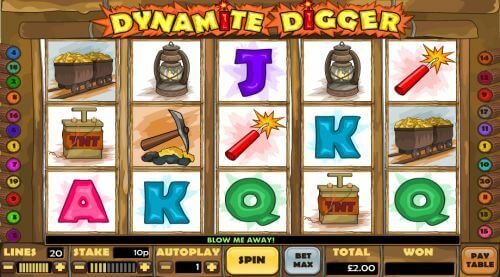 Bets on the Dynamite Digger slot machine are $0.01, $0.02, $0.05, $0.10, $0.20, $0.30, $0.50, $0.70, $1, $2 and $5 per line. You can select up to 20 paylines per spin. The maximum total bet is $100 per spin, which is a good betting range for casual players as well as high rollers. To play the Dynamite Digger online slot game, select your bet and press “Spin” or use the “Bet Max” button. The top-paying symbol on the Dynamite Digger video slot is the Miner symbol. If you land 5 Miner symbols on a selected payline, you will win the 5000 coin top jackpot. Other high paying symbols on the Dynamite Digger slot game include the Mining Carts (2500 coins) and Pickaxe (1000 coins). All winning symbol combinations will trigger Dynamite Digger’s Exploding Reels feature. The combinations will be evaluated, paid out (when applicable) and then will explode and disappear. All empty symbol positions on each reel are filled as symbols tumble from above, in sequence, to fill the empty spaces. The payouts will then be made for newly created winning combinations. The Exploding Reels feature will remain active until no winning symbol combinations are created. You can create lots of extra winning combinations using the Exploding Reels feature when you play the Dynamite Digger video slot at Bovada! Dynamite Digger has a basic autoplay mode. You can use its autoplay feature to play 1, 2, 3, 4, 5, 10, 15, 20, 30, 40 or 50 autoplay spins. Use the “+” and “-” buttons to select the desired number of autoplay spins. You can stop the autoplay mode on the Dynamite Digger slot machine at any time. The Dynamite Digger video slot doesn’t have much in traditional video slot special features like a wild symbol, scatter wins, free spins or a bonus game, but instead offers a unique cascading symbols special feature called the Exploding Reels feature. You can try this Exploding Reels feature out when you play the Dynamite Digger slot game at Bovada! Can players from the USA play the Dynamite Digger video slot for real money? No, players from the United States cannot play the Dynamite Digger slot game for real cash. Instead, we suggest you read our California Gold Video Slot Review or play it at Bovada. Can I play the Dynamite Digger flash game for free? No, you can only play Dynamite Digger for real money at this time. For a similar-themed slot that you can play for free, we recommend the Gold Boom video slot that you can play at Win A Day Casino. Do I need to download any casino software to play Dynamite Digger? No, the Dynamite Digger online slot is played in your browser. If you experience any issues with the flash casino, make sure you have the latest version of Adobe Flash Player.